Western Rite Orthodoxy, Western Orthodoxy, or Orthodox Western Rite are terms used to describe congregations that are within Churches of Orthodox tradition but which use liturgies of Western or Latin origin rather than adopting Eastern liturgies such as the Divine Liturgy of St. John Chrysostom. While there are some ancient examples of Western Rite communities in areas predominantly using the Byzantine Rite before the Great Schism was fully consolidated (the Monastery of Saint Mary of the Latins, often referred to as Amalfi, is a common example), the history of the movement is often considered to begin in the nineteenth century with the life and work of Julian Joseph Overbeck. Western Rite parishes and monasteries exist within certain jurisdictions of the canonical Eastern Orthodox Church, predominantly within the Russian and Antiochian jurisdictions in North America, with the latter having created an Antiochian Western Rite Vicariate (AWRV). In addition, the Western Rite is practiced within religious communities outside the main Eastern Orthodox Church. The Communion of Western Orthodox Churches and the Orthodox Church of France are entirely Western Rite. Furthermore, there is a small number of Western Rite communities among the Old Calendarists, such as the former Western Rite Exarchate of the Holy Synod of Milan and the Autonomous Orthodox Metropolia of North and South America and the British Isles. In the past, there have also been Western Rite communities within Oriental Orthodoxy. Western Rite parishes are found almost exclusively in countries with large Roman Catholic or Protestant (particularly Anglican) populations. There are also numerous devotional societies and publishing ventures related to the Western Rite. Despite having a place within many Eastern Orthodox jurisdictions, the Western Rite remains a contentious issue for some. In the times prior to theological disputes that arose between 9th and 11 century, Byzantine Rite churches of the East and Latin Rite churches of the West were in full communion, confessing the same Orthodox, Catholic Christian faith. In the East, the Byzantine Rite was the predominant liturgical rite. In the West, the Latin Rite was the dominant rite. In the time of the final East–West Schism of 1054, most of the Churches that remained in communion with four Eastern Patriarchates used the Byzantine Rite, though there were still regions where other liturgies, including the Roman Rite, were used. One of such regions was Byzantine (southern) Italy. In the time of the final split (1054) much of the southern Italy was still under Byzantine rule and was organized as the Catepanate of Italy. For centuries, church life in Byzantine regions of Italy was developing under dual influence of Latin and Byzantine traditions. During the 11th century, Latin rite churches in Byzantine Italy still did not use the interpolated Creed (Filioque) and were in full communion with Eastern Orthodoxy. During the Byzantine–Norman wars, Byzantine Empire finally lost its last positions in the West. The Norman conquest of southern Italy was completed with the Conquest of Bari in 1071. One of the main consequences of the political change was the establishment of the supremacy of the Church of Rome over the church life in former Byzantine Italy. The main theological challenge was resolved at the Council of Bari in 1098. From that point, all churches in southern Italy were obligated to accept the Filioque clause into the Creed. Implementation of that decision soon marked the end of Latin rite Orthodoxy in southern Italy. After the 11th century, the Byzantine Rite was gradually becoming dominant in the Eastern Orthodox world, almost to the point of exclusion of any other liturgy. Traditions of old Western Orthodoxy were still regarded with high reverence by Eastern Orthodox theologians, but for centuries no organized attempt was made to preserve or revive the Latin branch of Orthodoxy. This changed in the late 19th and early 20th centuries when some Western Christians converted to Orthodoxy but retained some of their Western liturgical forms of worship. During the 1840s, William Palmer, a Church of England priest, corresponded with Russian Orthodox Church / Metropolitan Philaret Drozdov, of Moscow, and Aleksey Khomyakov. As a part of his conversion into the ROC, Overbeck requested permission from the Holy Synod of the Russian Orthodox Church to begin a Western Orthodox church in England. Initially, Philaret was hesitant about Overbeck's request, but did not rule out the idea entirely. Overbeck outlined his rationale for a Western Orthodox Church in his 1866 book Catholic Orthodoxy and Anglo-Catholicism, a largely polemical work describing why the established Western churches should be rejected. In 1867 Overbeck began to edit The Orthodox Catholic Review, a periodical for the advancement of Western Orthodoxy. Overbeck convinced others about the feasibility of a Western Orthodox church and in 1869 submitted a petition containing 122 signatures, including many in the Oxford Movement, to the Holy Synod asking for the creation of a Western liturgical rite within the ROC. A synodical commission investigated Overbeck's petition, in 1870 he stated his case before the commission in St. Petersburg. The commission approved the petition and he was instructed to present a revised Western liturgy for evaluation by the commission. He presented a revised Western liturgy in December. That liturgy was subsequently approved for use – specifically in the British Isles. Over the next several years, Overbeck developed liturgies for administering other sacraments and for praying a Divine Office. Overbeck attempted to woo[how?] Old Catholics to his scheme since they had recently schismed from the Roman Catholic Church over First Vatican Council's dogmatic definition of Papal infallibility, though to little avail. During this time, he continued to criticize Roman Catholics and Anglicans as well as those Western converts to Orthodoxy who utilized the Byzantine Rite. By 1876, Overbeck appealed to other Orthodox Churches for their recognition of his plan. In 1879 he was received in audience by the Patriarch Joachim III of Constantinople, who recognized the theoretical right of Western Christians to have a Western Orthodox Church. Three years later, Joachim III and the Synod of the Ecumenical Patriarchate conditionally approved Overbeck's Western rite and Benedictine offices. However, Overbeck's efforts ultimately did not result in the establishment of a Western Orthodoxy. He was especially suspicious of the role which the Greeks in London (and the Church of Greece generally) played in the stagnation of his ambitions, directly blaming the Greek Church's protest against the plan in 1892. (p26) The Orthodox Catholic Review ended publication in 1885 and Overbeck died in 1905 without seeing a Western Orthodox Church. Georges Florovsky summed up Overbeck's experience in this way: "it was not just a fantastic dream. The question raised by Overbeck was pertinent, even if his own answer to it was confusedly conceived. And probably the vision of Overbeck was greater than his personal interpretation." While Overbeck did not live to see his dream successful, the idea of a Western Orthodox church did not disappear. The early part of the twentieth century was characterized by a series of false starts. In 1911, Arnold Harris Matthew (a former Roman Catholic priest, later consecrated an Old Catholic bishop), entered into union with the Oriental Orthodox Patriarchate of Antioch under Metropolitan Gerasimos (Messarah) of Beirut and, in 1912, with the Eastern Orthodox Pope Photios of Alexandria. [disputed (for: conflicts with multiple reliable sources) – discuss] Bishop Mathew's 1909 Old Catholic Missal And Ritual may have been approved as a Western Rite liturgy by Pope Photios of Alexandria,[speculation?] who wrote: "...We have thanked God...that you omit the Filioque clause, and that you do not accept money for celebrating Masses. We agree with you as to the observance of your autonomy, and of the Latin Rite in actual use, so long and so far as they agree with the Holy Dogmas and with the canonical ordinances of the Seven Oecumenical Synods, which form the basis of the Orthodox Faith. "[self-published source] Both unions were contracted in quick succession and only lasted for an effective period of a few months. Though the union was protested by the Archbishop of Canterbury to Photios and the Patriarch of Antioch, Matthew's group claimed that communion was never formally broken off. In 1890, the first Western Rite Orthodox community in North America, an Episcopal parish in Green Bay, Wisconsin, pastored by Fr. René Vilatte, was received by Bishop Vladimir Sokolovsky. [disputed – discuss] However, Vilatte was soon ordained a bishop in the Jacobite Church, an Oriental Orthodox Church not in communion with the Eastern Orthodox Church. Other small groups using the Western Rite have been received, but usually have either had little impact or have declared their independence soon after their reception. Western rite parishes were established in Poland in 1926 when a half-dozen congregations were received into Eastern Orthodoxy; however, the movement dwindled during World War II. In 1936, the ROC received a small group led by a former Liberal Catholic bishop, Louis-Charles Winnaert (1880–1937), as l'Église Orthodoxe Occidentale (EOO). Winnaert was received as an archimandrite, took the religious name Irénée, and soon died. Winnaert's work was continued, with occasional conflict, by one of his priests, Eugraph Kovalevsky (1905–1970) and Lucien Chambault, the latter of which oversaw a small Orthodox Benedictine community in Paris. After 1946, Kovalevsky began to recreate a Gallican rite based on the letters of Germain of Paris, a sixth-century bishop of Paris, numerous early Western missals and sacramentaries, and some Byzantine modifications; his development was The divine liturgy of Saint Germanus of Paris. Archimandrite Alexis van der Mensbrugghe, a former Roman Catholic monk, who taught at the Western Church's St. Denys Theological Institute but remained in the Eastern rite, attempted to restore of the ancient Roman rite, replacing medieval accretions with Gallican and Byzantine forms. Eventually, Alexis was consecrated as an ROC bishop in 1960, continued his Western Rite work under the auspices of the Moscow Patriarchate. In 1953, pressured by the Russian Orthodox Church[clarify] to adopt the Eastern rite, the Western Orthodox Church went its own way, changing its name to the Orthodox Church of France. After several years of isolation, the Church was recognized as an autonomous Church by Metropolitan Anastasy Gribanovsky of ROCOR and was in communion with ROCOR from 1959 to 1966. Archbishop John Maximovich (ROCOR's representative in Western Europe at the time), became the archpastor of the Church of France. At this time, Maximovich had the Church change its name to l'Église Orthodox Catholique de France (ECOF). Maximovich also consecrated Kovalevsky in 1964 as a bishop. Kovalevsky took the religious name Jean-Nectaire. Maximovich's death in 1966 was a serious blow to the Western Orthodox Christians in France. While the Russian Orthodox Church[clarify]'s Western Rite mission withered and ended, ECOF thrived; however, after Maximovich died, Kovalevsky was left without canonical protection until his death in 1970. In 1972, the Church found a new canonical superior in the Romanian Orthodox Church. Gilles Bertrand-Hardy was then consecrated as bishop and took the religious name Germain of Saint-Denis. In 1993, after long conflict with the Synod of the Romanian Orthodox Church about alleged canonical irregularities within ECOF, the Romanian Orthodox Church withdrew its blessing of ECOF and broke off communion. The Romanian Orthodox Church decided, which is contested by ECOF, to depose Bertrand-Hardy from all sacerdotal functions. This decision (which was never accepted by ECOF) is applied by the canonical dioceses of the AEOF (Assemblée des Evêques Orthodoxes de France). The sanction was confirmed and explained in 2001 by another document, "Avis d'expertise canonique" from the Secretary of the Romanian Synod (a document which the ECOF considers to have no value). The Romanian Orthodox Church established a deanery under Bertrand-Hardy's brother, Archpriest Gregoire Bertrand-Hardy, to minister to those parishes which chose to remain in communion with the Romanian Orthodox Church. In 2001, scandalized by the revelation within ECOF of Bertrand-Hardy's 1995 marriage and subsequent annulment, ten parishes separated from ECOF, formed the Union des Associations Cultuelles Orthodoxes de Rite Occidental (UACORO), and began negotiations in 2004 with the Serbian Orthodox Church to be canonically recognized, with the intention of the UACORO entering the Diocese of France and Western Europe. The laity and clergy of UACORO were received individually into the French diocese of the Serbian Orthodox Church in 2006. These parishes are now predominantly Byzantine Rite, with the Gallican Liturgy served a few times a year. Of the communities that left ECOF the only ones which now retain the Western Rite are those that went on to form the Orthodox Church of the Gauls. Saint Tikhon of Moscow's contribution to the Western Rite has been more enduring. While he was bishop of the ROC's diocese in America, some Episcopalians were interested in joining Orthodoxy while retaining Anglican liturgical practices. Tikhon, sent the 1892 Book of Common Prayer, enquired about the viability of Orthodox parishes composed of former Anglicans using Anglican liturgical practices. In 1904, the Holy Synod concluded that such parishes were possible and provided a list of doctrinal corrections to the Book of Common Prayer's text of the prayers and rites that were necessary to profess in Orthodox worship. The Holy Synod also concluded that detailed changes in the Book of Common Prayer and in Anglican liturgical practices, together with compilations of new prayers, and entire rites, can only be carried out on location in America and not from Moscow. While Tikhon did not receive any Episcopalians as none approached him for reception into the ROC, his efforts laid the groundwork for the later reception of Episcopalians into the AWRV following the 1975 revision of the Book of Common Prayer. The most successful and stable group of Western Rite parishes originated within the Orthodox Church under Bishop Aftimios Ofiesh in the 1930s as part of the American Orthodox Catholic Church. In 1932, Bishop Aftimios consecrated an Episcopal priest, Ignatius Nichols, as auxiliary Bishop of Washington and assigned him to the Western Rite parishes. However, due to complaints from Episcopalians that the Episcopal Church was the "American" Orthodox Church, the American Orthodox Church that Aftimios and Nicholas were a part of became estranged from what would become ROCOR and the Orthodox Church in America (OCA). The subsequent marriages of both Aftimios and Nichols violated Orthodox canon law, and left the church and its subsidiaries without canonical recognition. It was ... during the tempestuous days following the Bolshevik Revolution that the Society had its inception as a missionary organ of the nascent federation of American Orthodox colonies under Russian suzerainty, though of local Syrian administration. With the collapse of that plan and the submission of the ethnic groups to the churches of their homelands, the Society was left in isolation. Through Father Paul Schneirla, he began unofficial dialogue with Metropolitan Antony Bashir. Even before this, Turner had been promoting Western Rite Orthodoxy through his periodical Orthodoxy. In 1961, the Society (consisting of three parishes) was received into the Syrian Antiochian Archdiocese on the basis of Metropolitan Antony's 1958 edict. Upon reception, Bishop Alexander Turner became a canonical priest of the Antiochian Orthodox Church, guiding the group as Vicar-General until his death in 1971, thereafter he was succeeded by Schneirla. However, after Turner's death, the sole surviving Basilian, William Francis Forbes, returned to the American Orthodox Catholic Church and was consecrated a bishop in October 1974. Besides the original communities associated with the Society, a number of other parishes have been received into the Western Rite Vicariate of the Antiochian Archdiocese, particularly as elements within the Episcopal Church became dissatisfied with liturgical change and the ordination of women. The first Episcopal parish to be received into the AWRV was the Episcopal Church of the Incarnation in Detroit, Michigan. Additionally, several Western Rite missions have been founded within the AWRV, some growing into full parish status. Furthermore, when parishes of the Evangelical Orthodox Church joined the Antiochian Archdiocese in 1987, a few parishes joined as Western Rite congregations. However, many of these former EOC congregations subsequently switched to the Byzantine Rite. Among Old Calendarist groups, the sole jurisdiction utilizing a Western Rite is the Autonomous Orthodox Metropolia of North and South America and the British Isles, with approximately two dozen parishes. Due to their generally stricter stance, only older rites such as the Sarum are permitted. In 1995, the Church of Antioch also established a British Deanery to absorb converts from the Church of England,[clarify] though none of these congregations is now Western Rite. Western Rite Orthodoxy, in Australia and New Zealand, emerged mostly from Anglican and Continuing Anglican communities. Some communities were received[when?] into the ROCOR by Archbishop Hilarion (Kapral) of the Diocese of Sydney, Australia and New Zealand. Other were received[when?] into the Greek Orthodox Church of Antioch by Bishop Gibran (Ramlawi) and Metropolitan Archbishop Paul (Saliba), of the Antiochian Orthodox Archdiocese of Australia, New Zealand, and All Oceania. Saliba has recently[clarification needed] received around 30 Western Rite parishes in the Philippines. Some Western Rite parishes are also a part of the Oriental Orthodox churches. The Syrian patriarchate of Antioch consecrated Antonio Francisco Xavier Alvares as Archbishop of Ceylon, Goa and India in 1889, authorizing a Roman rite diocese under his supervision. Additionally, in 1891 the Syrians consecrated Vilatte as archbishop for the American Old Catholics. ROCOR would no longer ordain clergy for Western Rite parishes. Bishop Jerome Shaw of Manhattan would be censured for unapproved ecclesial services and forcibly retired without the right to perform ordinations. Some ordinations performed by Shaw would not be recognized, and those candidates would be thoroughly examined before regularization. A commission would examine how to integrate Western Rite clergy and communities into the Russian Orthodox Church. Western Rite clergy and communities need to adopt the order of divine services of the Eastern Orthodox Church, but may preserve "certain particularities of the Western Rite". Adherence to the rules and traditions of the Russian Orthodox Church in particular is required. However, despite the fact that the Russian Orthodox Church Outside of Russia never officially reversed this decision, new Western Rite parishes and monasteries continue to be founded by ROCOR and priests within the Western Rite continue to be ordained as of 2018, including in Sweden and the United States. Mention of the Western Rite was often made in the OCA, the most prominent being a mention during a speech by the primate of the OCA, Metropolitan Jonah Paffhausen, in April 2009. On September 8, 2018, the Orthodox Church of America established a Western Rite mission parish in Alberta, Canada. However, the OCA has not yet officially established an organizational structure for future Western Rite parishes. The Divine Liturgy of Saint Tikhon – This liturgy is currently used by approximately two-thirds of congregations in the AWRV. The Rite of St Tikhon was developed utilizing the 1928 American Book of Common Prayer and the Anglican Missal. The Book of Common Prayer was altered by removing the filioque from the text of the Nicene Creed, adding prayers for the dead, the invocation of the saints, and strengthening the epiclesis within the Eucharistic prayer, and by adding the pre-communion prayers from the Byzantine Rite. It is utilized primarily by former Anglican and Episcopalian background parishes. The Divine Liturgy of Saint Gregory – Utilized by the remainder of the AWRV as well as some communities in ROCOR, this rite is a version of the Roman Tridentine Mass which has been altered to remove the filioque and by inserting a Byzantine epiclesis. It is used primarily by former Lutheran, Roman Catholic, or Old Catholic background parishes, including those incorporated from the Society of Saint Basil in 1961. In the Russian Orthodox Church, there are three versions in common use: that of Overbeck (which was printed in full in the 1960 ROCOR yearbook), the Use of Mt. Royal (based upon the Carthusian use, itself adapted from the old rite of Grenoble), and the derivative use of Christminster (Usus Providentiae) which includes an epiclesis from the Gothic Missal. The Sarum Liturgy – A British use of the Divine Liturgy of Saint Gregory, which retained many local Anglo-Saxon, Gallican, and Celtic elements. It is celebrated within ROCOR by the St Bride Hermitage and by the Hermitage of the Holy Cross. It is also occasionally celebrated at St Nicholas ROCOR Monastery in Ft. Myers, Florida. The text is based upon a nineteenth-century Pearson English translation of the Sarum Missal, corrected of post-Schism insertions. An epiclesis from the Gothic Missal is included. St Hilarion Press and St Gregory's Press editions of Sarum services were blessed for canonical use, in September 2008 and December 2008, respectively. The English Liturgy – The Russian adaptation of the 1549 English Book of Common Prayer according to the criteria set forth by the Holy Synod of Russia in 1907. This liturgy has been augmented with material from the Sarum Missal, Gothic Missal, York rite, and 1718 Scottish Non-Juror liturgy. An epiclesis from the Gothic Missal is included. This liturgy is not the same rite as the Liturgy of Saint Tikhon, and the two rites differ in many respects. The Liturgy of Saint Germanus – Utilized by the French Orthodox Church, the Orthodox Church of the Gauls, and the Orthodox Church of France, as well as some parishes of ROCOR and the Serbian and Romanian Patriarchates. The liturgy of St Germanus is a reconstructed version of the Gallican mass, supplemented with elements from the Byzantine, Celtic and Mozarabic rites. The Liturgy of Saint John the Divine – Utilized by a monastery of the Moscow Patriarchate, and in publication within ROCOR. It is a reconstructed version of the first millennium Celtic rite of the British Isles, from the Stowe Missal and other sources, and intended for modern use. The name is from the origin asserted by the Church in the British Isles before the Great Schism. The Mozarabic Rite – The Autonomous Orthodox Metropolia of North and South America and the British Isles as well as the Holy Synod of Milan permit use of the Mozarabic Rite and the Sarum use. The Ambrosian Rite – The Ambrosian rite may be used in Western rite parishes of ROCOR. The Glastonbury Rite – The Glastonbury Rite was at one time used in the Celtic Orthodox Church. Most of the present Western Rite liturgies have been developed along the guidelines given to Saint Tikhon by the Holy Synod in 1904/07. As noted above, Tikhon's request to the Holy Synod concerned accepting Episcopal parishes into the Orthodox Church while permitting them to retain the liturgies of the Book of Common Prayer. While Saint Tikhon's request was specifically concerned with Anglicans converting, its recommendations came to be implemented for those parishes who did not have a specifically Anglican background. The two most important required changes included the removal of the filioque from the Nicene Creed and the addition of an epiclesis which specifically invokes the Holy Spirit and a petition for the Spirit to change the bread and wine into the Body and Blood of Christ. When the Antiochian Western Rite Edict was issued, it became necessary to determine what additions or corrections to western liturgies would need to be made to bring those rites into conformity with the 1904 Russian Synodal decree as well as the Ukase of 1936. To that end, the Antiochian Western Rite Commission was convened in 1958 composed of Fr Paul Schneirla, Stephen Upson, Alexander Schmemann and John Meyendorff for the purpose of determining "the mode of reception of groups desiring to employ the Western Rite, and the character of the rites to be used, as well as the authorization of official liturgical texts." Meyendorff, Schmemann, and Schneirla were already familiar with the Western Rite both from having been in contact with members of the ECOF while teaching at Saint Sergius Theological Institute. Schmemann actively followed the Liturgical Movement in the Roman Catholic and Anglican Church and was an advocate for renewal of the Orthodox liturgy. In January 1962, the official Western Rite Directory was issued, "establishing liturgical usages and customs and discipline", drawing on principles of the 1904 Moscow Synodal response to Saint Tikhon, the authorization of Western Rite offices by Metropolitan Gerassimos (Messarah) of Beirut, and the 1932 Russian Ukase of Metropolitan Sergius. Officially, the AWRV provides one liturgical book, The Orthodox Missal, which contains both the Liturgy of Saint Tikhon and the Liturgy of Saint Gregory, with appropriate propers for seasons, feasts, saints, and prayers before and after Mass. The Antiochian Archdiocese publishes the Saint Andrew Service Book (SASB), also known as The Western Rite Service Book, which was developed by Saint Michael's Church in California under the leadership of the late Father Michael Trigg; the 1996 second and 2005 third editions of the SASB received official sanction from Metropolitan Philip Saliba, with the latter containing explicit reference to the authorized nature of all previous editions of the SASB. In addition to duplicating the contents of The Orthodox Missal, the SASB also includes forms for Matins and Vespers, the Benediction of the Blessed Sacrament, and the threefold Amen common to the Byzantine epiclesis but absent in The Orthodox Missal. The SASB was produced by the Antiochian Archdiocese without the participation of the AWRV. The Orthodox Missal is an official publication of the AWRV and is the Vicariate's standard and approved text with the SASB authorized by the Archdiocese as an approved text. Parishes within the AWRV are permitted to use either the Liturgy of Saint Tikhon or that of Saint Gregory. 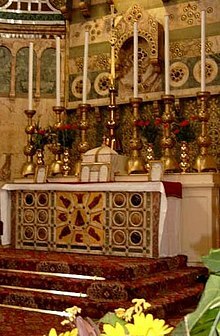 While most parishes use the Tikhonite liturgy, several use the Gregorian liturgy on weekdays or on specific Sundays of the year. Presently, there is no breviary specifically designed for the Orthodox Western Rite, though priests of the AWRV who celebrate the Liturgy of Saint Gregory are expected to pray as much of the Breviarium Monasticum as possible, in the Anglican Breviary. The same hours, in English or Latin, are approved for Christ the Savior Monastery under the ROCOR. However, priests who celebrate the Liturgy of Saint Tikhon pray a form of Morning Prayer and Evensong approved by the AWRV. Also in common use within the AWRV, though not officially approved, are St. Dunstans's Plainsong Psalter, The English Office Noted, and the St. Ambrose Hymnal. The St. Dunstans's Plainsong Psalter sets the Psalter and selected canticles to Gregorian and British Chant and includes orders for Morning Prayer, Evensong, and Compline. The English Office Noted includes Morning, Noonday and Evening Prayers, Compline and the Psalter set in modern notation. The St. Ambrose Hymnal provides musical settings of classic Western hymns as well as post-schism and modern hymns which are judged "not to contradict the Orthodox faith." Within ROCOR, the Saint Colman Prayer Book has been authorized by Metropolitan Hilarion Kapral for use within the Diocese of Sydney, Australia and New Zealand. It has since received permission in other dioceses. The Book includes the Sarum rite, English rite, and Gregorian rite liturgies, together with a simplified version of the monastic hours. Most of the occasional services required by a Parish Priest through the course of the year are there, as well as the Rites of Holy Week and a Lectionary. In September 2008, Kapral blessed the Sarum Rite series published by St. Hilarion Press, originally under the auspices of the Holy Synod of Milan and edited by Hieromonk Aidan Keller, for liturgical use. [discuss] The Holy Synod of Milan also published approximately 30 volumes of texts of pre-schism services. They contain complete forms for celebration of the Liturgy or Mass, the Divine Office, the Mysteries or Sacraments, and many other services, with full chant notation. In December 2008, the St. Gregory's Press edition was also blessed for actual usage; these contains full forms, with complete chant notation, for the celebration of the Liturgy or Mass and of the Divine Office, i.e., the Canonical Hours. Among those Western Rite parishes that are within the Eastern Orthodox Church, some use the Eastern Orthodox liturgical calendar with the Byzantine Paschal cycle, while others use other calendars. The Communion of the Western Orthodox Churches uses the Gregorian Calendar to determine the dates of the holy days and Pascha, while each member church has its own liturgical calendar. The Luxeuil Lectionary, Missale Gothicum, Missale Gallicum, and the Gallican adaptations of the Martyrologium Hieronymianum are the chief authorities for the Liturgical year of the Gallican Rite. The Western Rite parishes of the Autonomous Orthodox Metropolia of North and South America and the British Isles follow the Julian calendar. Priests of the Western Rite utilize standard Western vestments as a part of their liturgy, whether celebrating one of the Western liturgies or (as far as Antiochians are concerned) when concelebrating a Byzantine liturgy, with some exceptions (See Criticisms below). Antiochian Byzantine Rite Orthodox priests who concelebrate Antiochian Western Rite liturgies wear Byzantine style vestments and hierarchs wear Byzantine vestments when participating in Western liturgies. Clergy using the Sarum or English liturgies use the vestments commonly known as Sarum but which were actually used throughout north-western Europe and the British Isles. These are typified by apparels' of the seasonal colour, added to the alb and amice for priest, deacon, subdeacon, clerk and servers in certain groups, although there is no evidence this was done before the thirteenth century. Unlike the 23 sui iuris Eastern Catholic Churches, which are autonomous ritual churches with separate hierarchies and canon laws, Western Rite Orthodox congregations of the Antiochian jurisdiction fall under the jurisdiction of their local Orthodox bishop. In North America, the Antiochian Church has established the AWRV and the Western Rite Commission to coordinate the activities of Western Rite congregations and to provide a single point of contact for persons and groups concerning Western Rite Orthodoxy. However, all the Western Rite congregations remain under the direct supervision of their normal diocesan bishop, with Bishop Basil (Essey) of Wichita being the "hierarch of reference" and advocate for Western Rite issues within the synod of Bishops. In the ROCOR, as of November 2009, all Western Rite Orthodox congregations and monastic houses fall under the jurisdiction of the Metropolitan. The Old Calendarists have two hierarchies which consider themselves Western jurisdictions and therefore have no liaison, citing the canonical responsibility of bishops to their local territories, opting to simply treat all parishes of Western and Eastern Rite equally. Of these, the larger Western Rite organization is the Autonomous Orthodox Metropolia of North and South America and the British Isles, with the presiding hierarch, Metropolitan John LoBue of New York and New Jersey, the only Orthodox bishop in North America who regularly employs Western usage in his monastery. The official publishing arm of the AWRV is St. Luke's Priory Press in Stanton, New Jersey. Among their publications are The Orthodox Missal, the official service book of the AWRV; The Orthodox Ritual, the official source for the administration of all the sacraments in the vicariate; and the annual Ordo Kalendar. They also publish several apologetic works concerning the Western Rite. Lancelot Andrewes Press is the publishing arm of the Fellowship of Saint Dunstan and publishes material which is utilized by congregations and individuals in Western rites. The primary mission of Lancelot Andrewes Press is to publish material for the "advancement of historic Christian orthodoxy, as expressed by the liturgical and devotional usages of traditional English Christianity." Among their publications are the Monastic Diurnal and St. Dunstan's Plainsong Psalter. While not official publishing houses, St Petroc Monastery, Christminster, and St. John Cassian Press have published copies of liturgies for use by ROCOR Western Rite congregations. St. John Cassian Press distributes former St. Hilarion Press publications (see "Organizations" above) blessed for ROCOR use, including Orthodox Prayers of Old England (omnibus service book), The Holy Psalter (core of the divine office), Old Sarum Rite Missal, The Companion (epistle and gospel book), Chant Ordinarium (a kyriale), and Westminster Benedictional (a book of blessings), in all some 2,500 pages of approved texts, with chant. This body of work includes several apologetic works concerning Western rites and Orthodoxy in general. The most voluminous texts of the Western Rite in English, however, have been produced by Old Calendarists: recently 10,000 pages of text of the Western monastic psalter in traditional English were placed online for free download and use. The Orthodox Christian Society of Our Lady of Walsingham – dedicated to encouragement of devotion to the Theotokos, particularly under the title of Our Lady of Walsingham (and the preservation of the replica of the shrine of Walsingham). The Fellowship of Saint Dunstan – dedicated to historic Christian Orthodoxy particularly traditional English Christianity. Parishes and missions belonging to the Western Rite can be found in a number of Orthodox jurisdictions. The single largest group of such communities is to be found within the Orthodox Church of France, followed by jurisdictions of the Eastern Orthodox Church, and the Communion of Western Orthodox Churches. There are also parishes and missions belonging to the Old Calendarist tradition. These groups are Canonical missionary societies with a core of canonical Orthodox laity served by canonical Orthodox clergy within the Orthodox Church with the goal of future reception of converts into the Western Rite of Orthodoxy. The societies themselves were formed inside the Orthodox Church for reception of converts, and not for the reception of the societies themselves. The Orthodox Church they are currently under the guidance of is also listed. Metropolitan Kallistos Ware says that the Western Rite is inherently divisive; following different liturgical traditions than their neighboring Byzantine Rite Orthodox Christians, those using the Western Rite do not share liturgical unity with them and present an unfamiliar face to the majority of Orthodox Christians. Ware is particularly concerned about the further fragmentation of Orthodoxy in non-Orthodox countries, in this case in Britain. ^ Cf. Alexander Schmemann, "Some Reflection Upon 'A Case Study'" St. Vladimir's Theological Quarterly 24.4 (1980), pp. 266–269; Gregory H. M. Dye, "Some Reflections on the Western Rite – II" St. Vladimir's Theological Quarterly 27.2 (1983), pp. 125–126; and Chrysostomos H. Stratman, The Roman Rite in Orthodoxy (Chicago: The Orthodox Christian Education Society, 1957), for examples. ^ Kidd, B. J. (1927). Churches Of Eastern Christendom – From A.D. 451 to the Present Time. Routledge. pp. 252–3. ISBN 978-1-136-21278-9. ^ a b Abramtsov, David F. (1961). The Western Rite and the Eastern Church: Dr. J. J. Overbeck and his scheme for the re-establishment of the Orthodox Church in the West (PDF) (unpublished? MA thesis). Pittsburgh: University of Pittsburgh. Archived (PDF) from the original on 2005-10-23. Retrieved 2014-05-26 – via Project Canterbury. ^ Parry, Ken et al., The Blackwell Dictionary, p. 365. ^ Sobranio mnenii i otzyvov Filareta, mitropolita moskovskago i kolomenskago, po uchebnym i tserkovno-gosudarstvennym voprosam, ed. Archbishop Savva, Tome V, Part II (Moscow, 1888), 711–713. ^ Florovsky, Georges (1956). "Orthodox ecumenism in the Nineteenth Century". St. Vladimir's Seminary Quarterly. 4 (3–4): 32. ^ Peter F. Anson. Bishops at Large, pp. 186–188. Berkeley: Apocryphile Press, 2006. ^ Parry, Ken et al., The Blackwell Dictionary, p. 515. ^ W. Jardine Grisbrooke, "Obituaries: Archbishop Alexis van der Mensbrugghe" in Sobornost 4.2 (1981), 212–216. One or more of the preceding sentences incorporates text from a work now in the public domain: [committee of the Holy Synod of the Russian Orthodox Church on Old Catholic and Anglican questions] (1917). Frere, Walter Howard (ed.). Russian observations upon the American prayer book. Alcuin Club tracts. 12. Translated by Wilfrid J. Barnes. London: A. R. Mowbray. pp. 34–35. OCLC 697599065 – via Project Canterbury. ^ Gary L. Ward et al., Independent Bishops, 295–96, 301–02. ^ Gary L. Ward et al., Independent Bishops, 143–44. ^ Benjamin J. Andersen, "An Anglican Liturgy in the Orthodox Church: The Origins and Development of the Antiochian Orthodox Liturgy of Saint Tikhon", Unpublished M.Div. Thesis, St. Vladimir's Orthodox Theological Seminary, 2005, p. 7. ^ Mayer, Jean-François (2012-04-23). "Western Rite Orthodoxy". sarumuse.wordpress.com. Translated by Anthony Chadwick. [s.l. ]: Anthony Chadwick. [self-published source] Translated from Mayer, Jean-François (May 2002). "Les tentatives de creation d'un rite orthodoxe occidental: esquisse historique". religioscope.com (in French). Fribourg: Institut Religioscope. Archived from the original on 2002-08-17. Retrieved 2007-06-21. Additional pages archived on 2002-08-25: Page 2, Page 3, Page 4, Page 5, Page 6, Page 7, Page 8. ^ Synod of Bishops of the Russian Orthodox Church Outside of Russia (2013-06-10). "An extraordinary session of the Synod of Bishops is held". russianorthodoxchurch.ws. New York: Synod of Bishops of the Russian Orthodox Church Outside of Russia (published 2013-07-12). Archived from the original on 2013-07-18. ^ Paffhausen, Jonah (2009-04-09). "+Jonah, in Dallas speech, challenges foreign Churches, stirs crowd". ocanews.org. Orthodox Christians for Accountability. Archived from the original on 2009-04-10. ^ "The English Liturgy: according to the Western Rite, derived from the Sarum, 1549, 1718 etc., adapted using the rules authorised by the Holy Synod of Russia". orthodoxresurgence.com. Archived from the original on 2008-07-24. ^ Catholic Apostolic Church (1979). The divine liturgy for the celebration of the Holy Eucharist according to the Glastonbury rite, commonly called the liturgy of Saint Joseph of Arimathea (6th ed.). London: Metropolitical Press. OCLC 16489110. ^ a b Mayer, Jean-François (2014). " 'We are Westerners and must remain Westerners': Orthodoxy and Western rites in Western Europe". In Hämmerli, Maria (ed.). Orthodox identities in western Europe: migration, settlement, and innovation. Farnham [u.a. ]: Ashgate. pp. 273–286. ISBN 9781409467540. ^ Mensbrugghe, Alexis van der (1962). Missel ou Livre de la synaxe liturgique: approuvé et autorisé pour les églises orthodoxes de rit occidental relevant du Patriarcat de Moscou. Contacts (in French). 38–39/supplement (revue and typ. ed.). Paris: Contacts. OCLC 716494134. ^ Benjamin Andersen, Western Rite History, Part 8, September 18, 2004. Last accessed March 16, 2007. ^ Alexander Schmemann, "Notes and Comments: The Western Rite" in St. Vladimir's Seminary Quarterly, 2.4 (1958), 37–38. ^ Western Rite History, Part 8, September 18, 2004. Last accessed March 16, 2007. ^ Antiochian Orthodox Christian Archdiocese of North America. Orthodox missal according to the use of the Western rite vicariate of the Antiochian Orthodox Christian Archdiocese of North America. Stanton, New Jersey: Saint Luke's Priory Press. OCLC 36287786. ^ a b Antiochian Orthodox Christian Archdiocese of North America. Saint Andrew service book: the administration of the sacraments and other rites and ceremonies according to the Western Rite usage of the Antiochian Orthodox Christian Archdiocese of North America (3rd ed.). Englewood Hills, New Jersey: Antiochian Orthodox Christian Archdiocese of North America. ISBN 9780962419072. ^ a b Andersen, Benjamin J. (May 2005). An Anglican liturgy in the Orthodox Church: the origins and development of the Antiochian Orthodox liturgy of Saint Tikhon (M.Div. thesis). Crestwood, New York: St. Vladimir's Orthodox Theological Seminary. p. 19. OCLC 166264677. ^ a b Andersen, Benjamin J. (May 2003). "Sacrificium laudis: the Anglican Breviary and the Ancient Western Orthodox Divine Office". westernorthodox.com. Denver, Colorado: St. Mark's Parish. Archived from the original on 2012-02-06. ^ Episcopal Church. The Anglican Breviary containing the Divine Office according to the general usages of the western church put into English in accordance with the Book of Common Prayer. Mount Sinai, New York: Frank Gavin Liturgical Foundation. OCLC 173467899. ^ "St. Dunstan's Plainsong Psalter". andrewespress.com. Andrewes Press. ^ "The Daily Office". stgregoryoc.org. Silver Spring, Maryland: St. Gregory the Great Orthodox Church. Archived from the original on 2015-09-26. ^ "Order the St. Ambrose Hymnal". stgregoryoc.org. Silver Spring, Maryland: St. Gregory the Great Orthodox Church. ^ E.g. : The old Sarum Rite missal: the liturgical heritage of old England, prepared for parish usage. Sarum Rite series. 6. Translated by Keller, Aidan. Austin, Texas: St. Hilarion Press. 1998. ISBN 9780923864156. ^ "The Rites of Orthodox England". Orthodoxengland.blogspot.com. 4 November 2009. Retrieved 10 October 2013. ^ Bishop Kallistos. "Some Thoughts on the 'Western Rite' in Orthodoxy" in The Priest: A Newsletter for the Clergy of the Diocese of San Francisco, 5, May 1996. This article incorporates text from Western Rite at OrthodoxWiki which is licensed under the CC-BY-SA and GFDL. Met. PHILIP (Saliba)'s Promise: Western Rite churches will not be Byzantized.